What are Signs that My Child is Being Bullied? School refusal and/or decline in grades. Complaints of headache, stomachache, sleep difficulties, or poor appetite. Missing or damaged personal belongings. Child/adolescent has very few friends and/or play dates. Child/adolescent seems to lack empathy, struggles with perspective taking, or lacks social skills (this relates to the bully and/or bullied). Create an open environment for your child to share his or her feelings and experiences. You can start by establishing a weekly time or date with your child. Any length of time is fine, as long as it is consistent. Try to maintain a calm and receptive demeanor. Children can easily feel their parents’ anxieties or insecurities. If they sense that they are making you feel too sad or upset, they might retreat. Supportive and validating statements such as, “I noticed that you have been frustrated or down lately; what can I do to support you?” can help initiate dialogue. Try to refrain from joining your child’s feelings of helplessness. It is important to model self-efficacy. Ask your child what form of bullying they are involved in. If necessary, you can call your child’s teacher or guidance counselor. Find out whether your child is a bully, being bullied, both a bully and being bullied, or a bystander. What has your child done to deal with bullying? How has he responded or reacted? Has he told anyone in school? What role is the school playing and how can they be of help? Has the teacher noticed a change in your child? Assess child’s safety and level of exposure to, or engagement in bullying. Set up a safety plan with your child and enlist teacher’s help (or someone your child trusts in school such as, a friend or counselor). If this is a cyber bullying issue, computer monitoring needs to be in place. Create a family policy on how to monitor computer time and controls or ipod and cell phone use. Ask child what u can do to help. What will they feel comfortable with? Tell your child to stay away from the bully. Make sure your child has a group of children to walk with if walking to and from school. Family and friends help bolster an adolescent’s positive characteristics and self esteem. Internalizing positive messages from family and friends will diminish the negative messages from the bully. Spend quality time as a family (i.e. movies, dinner, or bowling). Encourage child to spend time with their friends from camp, place of worship, or community. Remind your child that there are other students with whom they can befriend. Encourage your child to join an after school activity of their choice. Developing a new skill or hobby can improve self esteem and enhance social skills. Determine if your child would benefit from a social skills group or individual therapy. Ask the advice of a pediatrician, counselor, or teacher. Some youth who are involved in bullying have poor social skills, social anxiety, and struggle to establish or maintain friendships. A group setting is a great arena to learn and practice social skills. Help your child focus their energy on positive activities and events in the present. Develop positive self-statements: “Although I am being bullied, I am still me, a special person with many different qualities (have your child write down all of their unique qualities). 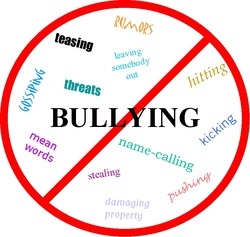 The bully cannot take away who I am.” Help child internalize this message. Although I can’t control the bully, I can control how I think and feel. I cannot allow the bully to get me down. What can I do when I feel sad or upset? Help your child create a list. Create a self-esteem building collage. You can work on one poster together or make separate collages. Cut out pictures, words, and positive self-statements that describe your child’s strengths, likes, and positive qualities. Add pictures of people that your child looks up to (family, friends, positive famous people) and trusts. Practice standing and walking with confidence. Practice looking someone in the eye and speaking in a strong and confidence voice. Help your child prepare for various situations that they might encounter in social settings, through role play. Together, think of a scenario and practice assertiveness, conflict resolution, and perspective taking. If your child sees someone being bullied, they can quietly tell a trusted friend, teacher, or counselor. Your child can say that they wish to remain anonymous. A bystander should NOT intervene during a bullying event that may become physical. If the bystander is a friend of the bully, the bystander can remind the bully how much trouble he got into the last time this happened. The bystander can also confront his friend (the bully) and tell him that his actions embarrassed the other adolescent and that it was not the right thing to do. Encourage your child to choose friends who possess the qualities that they value. We want friends who are honest, caring, generous, brave, confident, and smart. Remind your child to ignore gossip and stop rumors from spreading. Promote a positive and accepting peer culture. Encourage your child, whether a bystander, bullied, or bully, to get involved with local anti-bullying projects in their community center, library, school, or place of worship. Dr. Ariela Bellin is a therapist in Great Neck, New York.